DMove is a Microsoft Windows console executable. It can be used at a �DOS prompt� or from a Windows Shortcut. The program takes either one or two parameters. The first parameter is a filename or a folder. This is the source file or folder. The second parameter is the destination folder. If the second parameter is omitted then the destination folder is the same as the source folder and DMove only performs a rename. � JPEG and TIFF files are processed (NEF is a form of TIFF file). � The DateTime is located. The colons are removed and an underscore placed between the date and the time. For example �2007:10:21 15:56:26� becomes �20071021_155626�. � If SubSecTime can be located it is appended to the DateTime string. � The Model of the camera is located. This will be the filename suffix. If there is a space in the model then only the part of the model past the last space is used. For example �Nikon D200� becomes �D200�. � An underscore precedes the filename suffix. � The filename extension is preserved. A typical resulting filename might be �20071021_15562657_D200.NEF�. If any step in the formation of the filename fails the move/rename is not attempted. Each attempted move/rename is listed in the �DOS box�. If there is a failure this is also listed in the DOS box.. The destination folder must exist. It is not created. 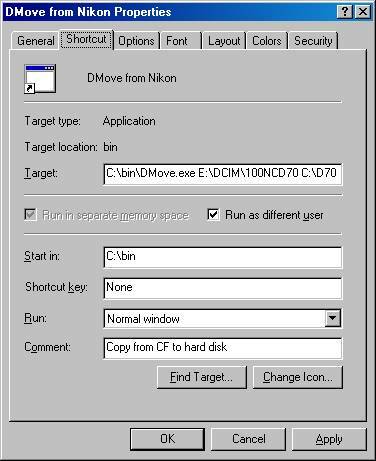 Note that in this example DMove.exe is in the C:\bin folder and that the parameters used in the Target are the same as the first Command line example. I actually use a Windows Shortcut to a batch file to accomplish my DMoves. The approach makes it unnecessary to know which directories on my CF card have images. I wrote this for myself and it has been quite helpful to me. I�m happy to share it with others. Feel free to let me know about your experiences with DMove.